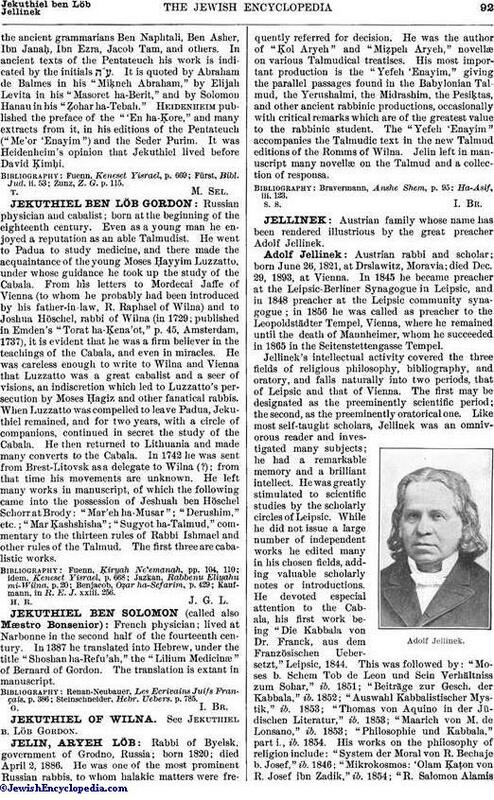 Rabbi of Byelsk, government of Grodno, Russia; born 1820; died April 2, 1886. He was one of the most prominent Russian rabbis, to whom halakic matters were frequently referred for decision. He was the author of "Ḳol Aryeh" and "Miẓpeh Aryeh," novellæ on various Talmudical treatises. His most important production is the "Yefeh 'Enayim," giving the parallel passages found in the Babylonian Talmud, the Yerushalmi, the Midrashim, the Pesiḳtas, and other ancient rabbinic productions, occasionally with critical remarks which are of the greatest value to the rabbinic student. The "Yefeh 'Enayim" accompanies the Talmudic text in the new Talmud editions of the Romms of Wilna. Jelin left in manuscript many novellæ on the Talmud and a collection of responsa.